ONE OF THE candidates for vice president of Fianna Fáil has staunchly defended the infamous Galway tent, describing it as being “among the most transparent, undertaken by any political party, on the island of Ireland”. Sligo-based Gerry O’Connor said the party’s long association with the building industry has been “demonised by those who believe they know ‘where it all went wrong’” in his leaflet canvassing for the support of members at this weekend’s Ard Fheis in the RDS. In the leaflet, O’Connor writes: “As if ‘a day at the races’ was the route of all evil. The fact is that the ‘Galway tent’ fundraising initiative was among the most transparent, undertaken by any political party, on the island of Ireland. The Galway tent became synonymous for Fianna Fáil’s close association with the building industry during the economic boom. 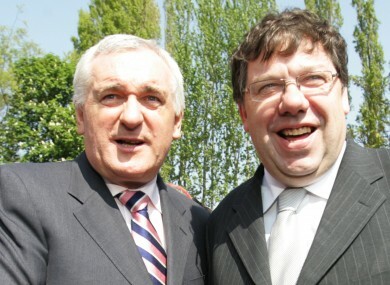 The tent was in existence for over a decade, but was abolished by former leader Brian Cowen in 2008 following a review of party structures. But O’Connor writes in his leaflet: “Those who criticised former Fianna Fáil ministers for rubbing shoulders with the followers of the ‘sport of kings’ would do well to remember the grooms and labourers; the vets and the lorry drivers; the caterers and the engineers who earn their living within these intrinsically Irish industries. O’Connor has been a constituency organiser and director of elections for Fianna Fáil since 2004 and is also the current county secretary of Sligo GAA. He is vying for one of five vice president positions in Fianna Fáil. Two of these are allocated to members of the parliamentary party, two for ordinary members and one for any member – either parliamentary or ordinary – of the party. Senator Mary White has already secured one of the vice presidency positions. Others vying for spots include TDs Éamon Ó Cuív and Timmy Dooley. Analysis: Can Fianna Fáil stop the in-fighting and bounce back? Email “A Fianna Fáil candidate has staunchly defended the infamous Galway Tent ”. Feedback on “A Fianna Fáil candidate has staunchly defended the infamous Galway Tent ”.